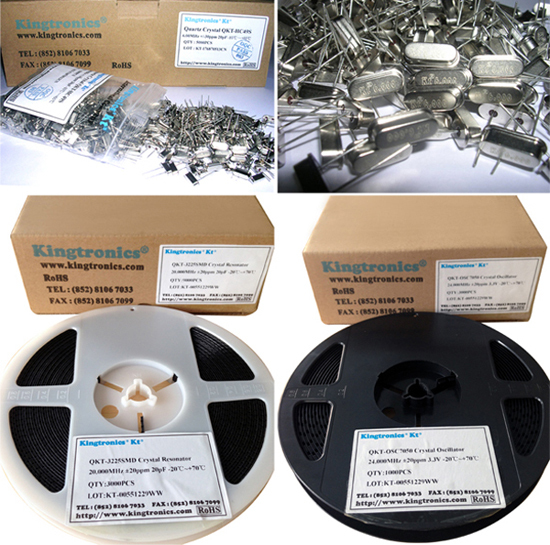 Kt Kingtronics Closes on Mar.30th-Apr. 02nd for Easter, Apr. 05th for Tomb Sweeping Day. Kingtronics closes on Mar.30th-Apr. 02nd for Easter, Apr. 05th for Tomb Sweeping Day. Quartz Crystal also known as Quartz Crystal Oscillator. That was accomplished by means of "Piezoelectric" effect. 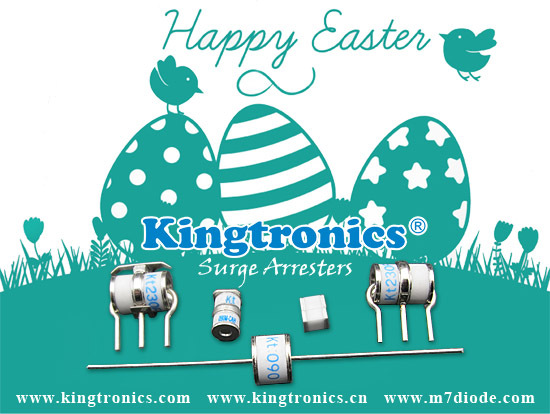 That is "Supply Voltage", Kingtronics common voltages are 1.8V, 3.3V, 5.0V. The semiconductor devices and resistance capacitance element worked together, could constitute a Quartz Crystal Oscillator. 4, 3*8 Tuning fork Cylindrical quartz crystal resonators suitable for space-constrained timing frequency stabilization of electronic products such as timers, electronic clock, calculator, etc. and 3225 SMD Crystals. We also produce active 3225, 5032, 5070 SMD Oscillators. 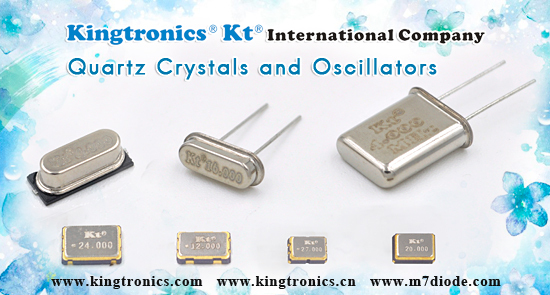 We produce millions pieces of Quartz Crystal and SMD Oscillators monthly, the volume is keep increasing. Free samples for testing. 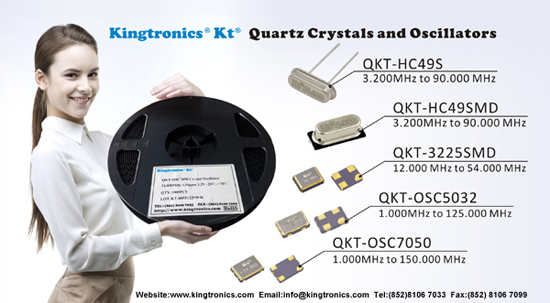 In January 2015, in order to meet customers demands, we prepared new Quartz Crystals and Oscillators samples to SGS lab. After two weeks, we get the updated new RoHS 2.0 Test Report . Below is the full list of our Kingtronics RoHS report, please have a quick view. Above products are tested not including 155 substances of very high concern(SVHC) under Regulation(EC) No 1907/2006 of Reach. 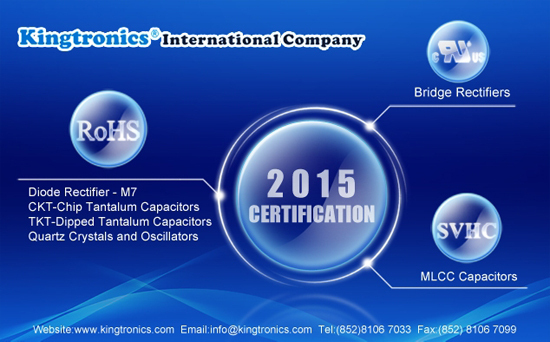 Kingtronics products are all with RoHS certifications. Please feel free to contact with us and test our samples. The basic unit of measurement of frequency. It is a measurement used to denote one complete occurrence of an event in one second. The frequency of a crystal is measured in megahertz (MHz) or kilohertz (kHz). In Kingtronics we usually usd KHz. Measured in Hertz (Hz), it is a periodic repetition of an event within a unit of time. Often called Calibration Accuracy, it is the amount of frequency deviation from the specified nominal frequency at room temperature (25°C). A capacitance, specified in picofarads (pF), presented to the crystal. The parallel load resonant frequency (FL) is a function of the load capacitance. For more details, please refer to below link, thank you. 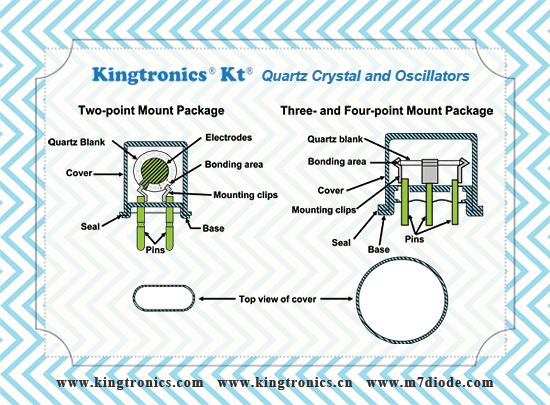 A quartz crystal resonator depends on the piezo-electric effect to work. This effect converts a mechanical stress in a crystal to a voltage and vice versa. In this way the piezo-electric effect converts the electrical impulses to mechanical stress which is subject to the very high Q mechanical resonances of the crystal, and this is in turn linked back into the electrical circuit. The quartz crystal can vibrate in several different ways, and this means that it has several resonances, all on different frequencies. Fortunately the way in which the quartz crystal blank is cut from the original crystal itself can very significantly reduce this. In fact the angle of the faces relative to the original crystal axes determines many of its properties from the way it vibrates to its activity, Q, and its temperature co-efficient. There are three main ways in which a crystal can vibrate: longitudinal mode, low frequency face shear mode, and high frequency shear. A cut known as the AT cut used for most crystals used in traditional radio and electronics circuits uses the high frequency shear mode.